Many vacation rental owners and managers struggle with the decision to update their home. Vacation rental remodel costs can start at several thousand dollars, and the process can become time consuming. However, remodeling a home may become necessary to attract guests, so they book that rental over a competitor’s. Renovating can increase interest and bookings, all generating more income and return on investment. Additionally, guests who book and enjoy the property are more apt to leave five-star reviews, which increases online exposure and may boost occupancy rates. 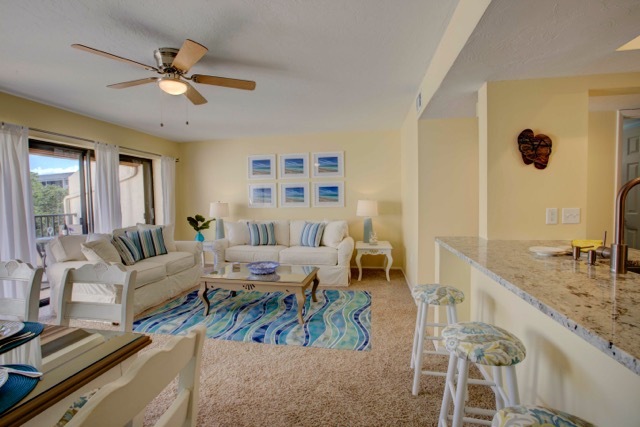 To help provide some insight on the topic, Loretta Luhman – a vacation rental manager for more than 25 years and owner of iTrip Vacations of Sarasota and Venice, Florida – has some tips and tricks for a vacation remodel process. The Luhmans decided to renovate, and the decision has lead to increased interest and higher occupancy. Although it took careful planning, time and work. 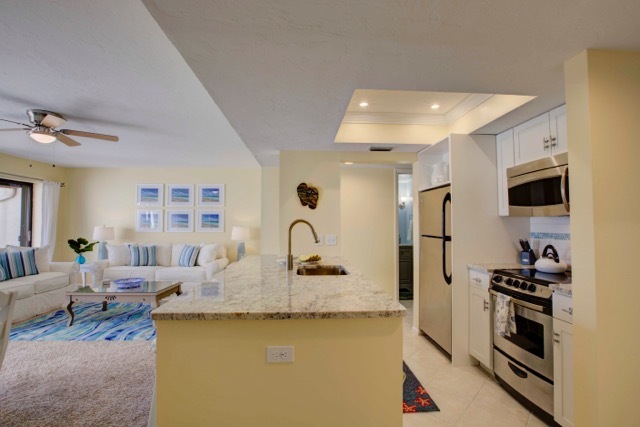 Learn more about the Luhmans’ vacation rental remodel and the return on investment. First, we made a game plan. Then we hired an award winning designer/contractor to steer us in the right direction. We tried to reuse what we could. 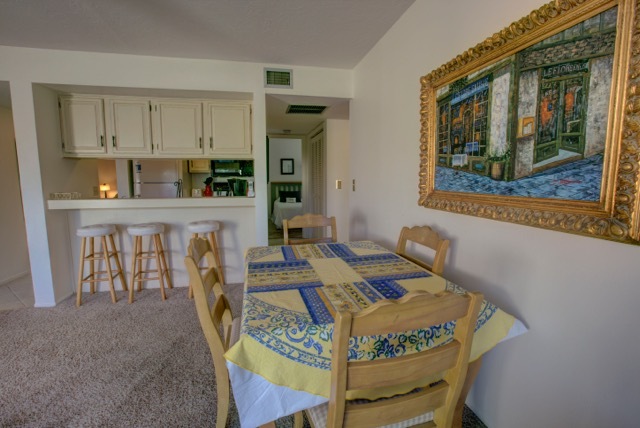 For example, the wooden furniture in the condo was all fine. We just needed to refinish it to cohere with the new beach theme. The upholstered furniture was the wrong scale for the unit’s size and needed to go. The condo was closed in, felt cramped and had too many walls, so we knew it had to open up. 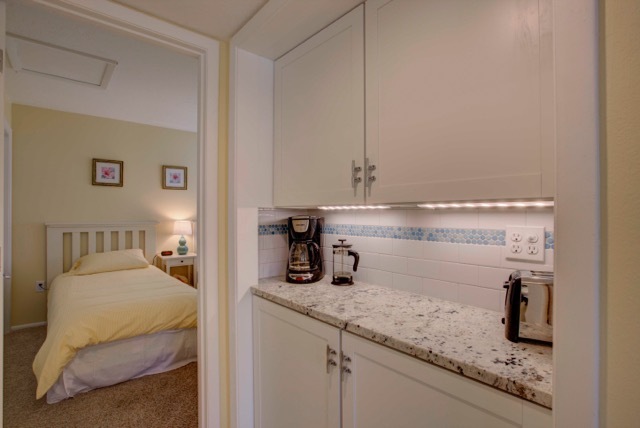 We decided not to replace the carpeting with wood or ceramic tile because the condo board required a specific rubber membrane for floor changes that would have significantly affected our entire budget. The carpet was also relatively new. Our designer, who specializes in kitchen and bath design and house-flipping projects, was Bob Santoro of Jackson Home and Garden with offices in Sarasota, FL, Jackson, NH and Santa Barbara, CA. Bob designed the project with a budget in mind and worked with vendors and suppliers to keep our price down. He is responsible for the new kitchen, baths, and the open feeling throughout the entire unit. He coordinated our renovation in Florida from his New Hampshire office. Bob Santoro has worked all over the U.S., and featured in more than a dozen publications. The kitchen was dated and closed in, so we opened it up and updated it. 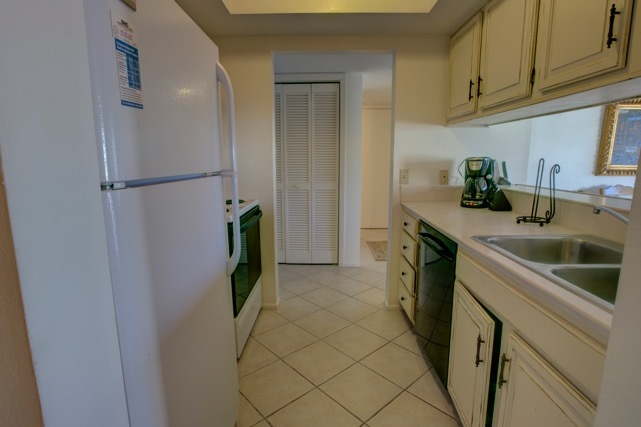 The original cabinets, counters, and appliances were all removed and replaced with new and more modern ones. We removed just one wall that blocked the kitchen, and it made the biggest difference. 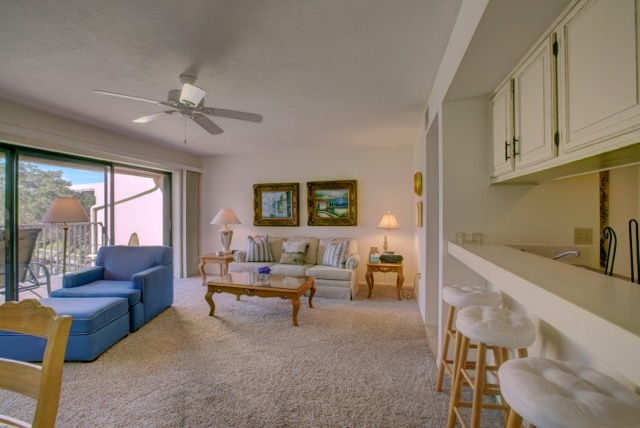 Now the condo hardly looks the same and offers an open floor plan to our guests. The dining table was painted and a larger flat-screen TV was added along with a custom banquette to add extra seating. 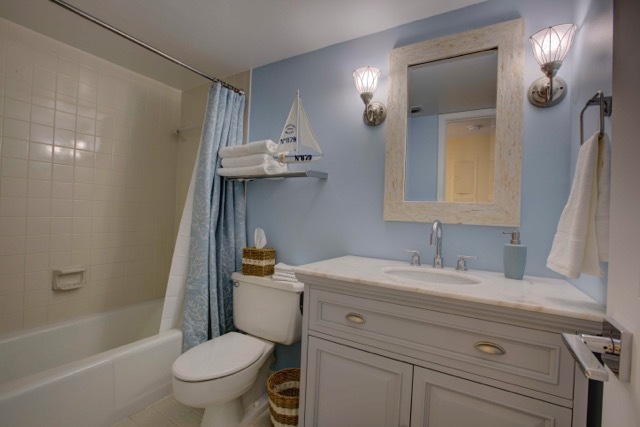 In the bathroom, the tub and tile were thoroughly cleaned and new plumbing and lighting fixtures added. The old sliding glass shower enclosure was removed and new luxury curtain, liner and rod put in its place. The room was given fresh paint and caulk. 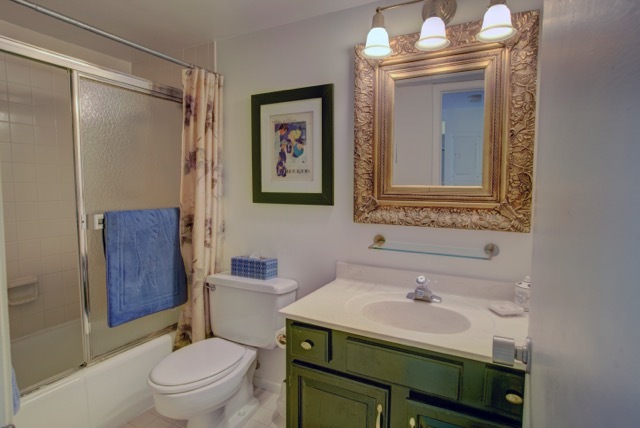 The vanity is from Home Decorator’s collection and the mirror is from Pier One. Sconce lights are from Lowes and towel racks and bars from Ikea. Original pantry closet doors were removed and now house upper and base cabinets for extra storage. 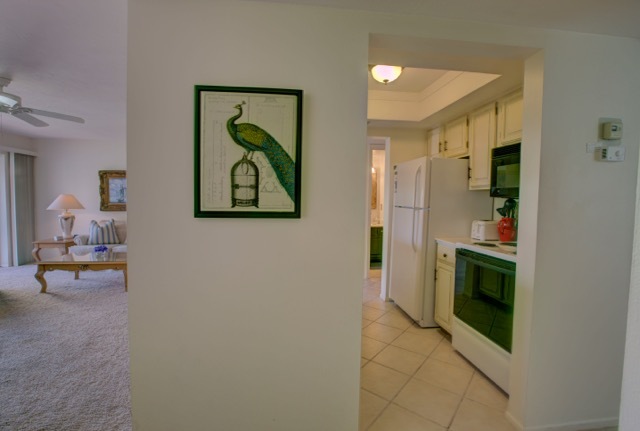 This not only added more counter space but made up for the cabinets that were permanently removed that hung over the sink and breakfast bar and blocked the view to the living room and outdoors. 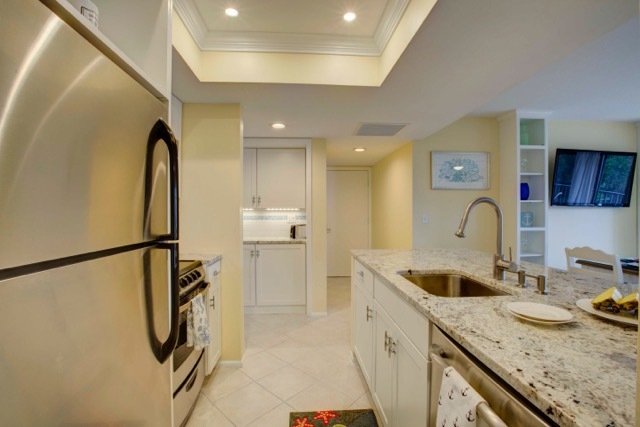 This not only added more counter space but made up for the cabinets that were permanently removed that hung over the sink and breakfast bar and blocked the view to the living room and outdoors. Almost every inquiry I get for my property starts with; “I love your property. It is beautiful”. As a rental manager, I get inquiries for a lot of properties and most of them start with “I am planning a trip to Sarasota”. This property books because of how beautiful it looks right from its first impression. This is giving us a huge return. I made rental income projections for my husband for the year. In 4 months, we’ve made half of my projections so far. I can’t wait to see how the year ends! 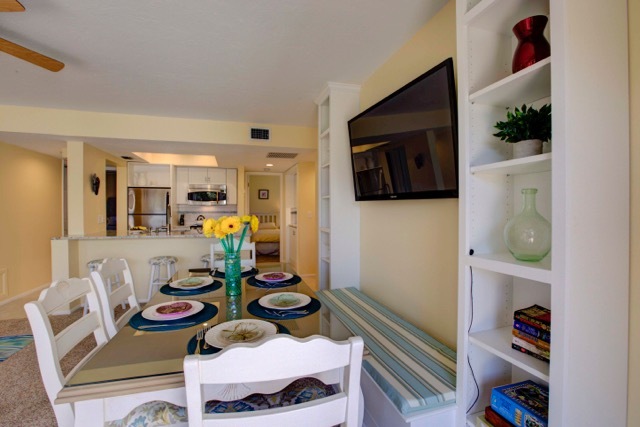 Since the remodel, a vacation rental website recently brought to our attention that the cover photos of the remodeled condo are receiving nearly twice as many clicks as other similar properties. More clicks translates to more bookings. Learn more about Loretta Luhman, owner of iTrip Vacations Sarasota and Venice. I really enjoyed working on theis project with Loretta and Jerry. Thanks, Bob. 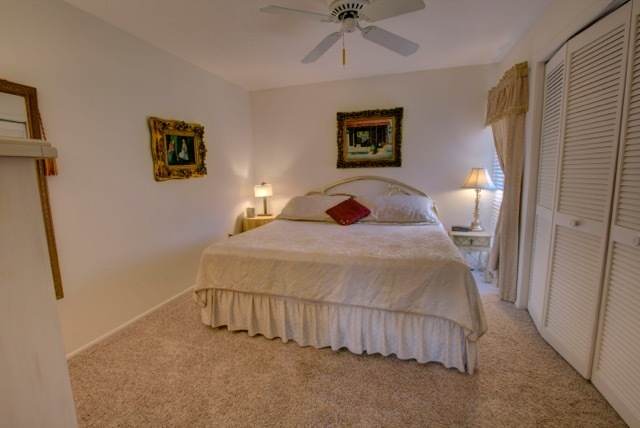 Loretta and Jerry are great to work with, and the home looks awesome! Enter your name and email address below, and we'll send you an email when a new post goes live!